Nestled within an old anniversary issue of the Jam-e-Jamshed (Mumbai edition) is sign after sign of the relationship between the Parsi community and food: Zorabian chicks, Ideal Corner, Jimmy Boy, Britannia & Co, Farrokh Khambatta, Cafe Royal, and any number of caterers and restaurants, some with their entire menu pasted for virtual consumption. In fact, food advertising in all its forms makes a significant portion of the announcements across the landscape of the community informer and noticeboard. Mistree says abstinence is considered evil. “Parsis celebrate at the drop of a hat, and food is important because it nurtures the body, which we consider the temple of god." Food is such an integral part of Parsi living that in the Muktad period (the 10 days preceding Navroze), they pay their dead the ultimate tribute—offerings of food. During Muktad or the Festival of Old Souls, families symbolically make offerings of food, flowers and clothing to the spirits of their deceased members. “We believe that the dead spiritually absorb the food, clothing and everything that’s offered," says Mistree. It is believed that even the souls which have been relegated to hell receive a 10-day reprieve to celebrate this festival, which is branded by visits to the fire temple. The average New Year celebration involves consumption, with equal emphasis on food and drink; excursions to the fire temple; and a sampling of the theatrics of a Parsi play or a dinner and dance. “It’s a family affair," says screenwriter and photographer Sooni Taraporevala. “When I was young, our family had such a huge older generation, and the extended family would gather at my house after going to the fire temple and we would also attend an Adi Marzban play. As for food, we always have yellow dal and fried fish." Dishes usually available for a wedding feast or Lagan Nu Bhonu are the most popular items on a New Year menu. 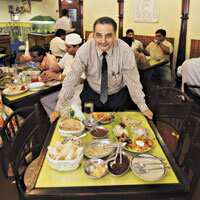 At Jimmy Boy in Mumbai’s banking district, the Lagan Nu Bhonu—which consists of three choices of fish, Salli Margi or Margi na Farcha and chicken or mutton pulao with Dhansak dal (vegetarian options, while available, don’t carry much credence with the community)—is available throughout the year. “We’re the only restaurant in the city, if not the country, that serves this option every day, and it is extremely popular on New Year," says Aspi Irani, proprietor of the restaurant. On New Year’s day, the restaurant does at least 200 meals, even though the owner says he has never really counted. Their melamine plates are adorned with a banana leaf cut-out, and each item is served separately in the company of Gajar Mewa Nu Achar, wafers androtli; the meal closes with Lagan Nu Custard or kulfi. For a more upmarket spread, the Grand Hyatt in the Mumbai suburb of Santacruz caters a Parsi promotional menu. The hotel introduced the concept for the first time last New Year, but the event proved so popular that the hotel decided on a longer promotion this year that began yesterday and goes on till 26 August. On the menu are deliciously egg-dressed Gos Na Cutlets or mutton cutlets, Kheema Per Eeda, which is minced mutton crowned with an egg, and Patra Ni Macchi, or pomfret topped with a coriander, chilli and coconut chutney and steamed in banana leaves. “These dishes, distinctly non-vegetarian, are normally only available to people who attend a Parsi wedding," says chef Anish Padgaonkar, “but our menu opens this sort of food up to a larger audience." Tanaz Godiwalla always advertises her services well in advance in the Jam-e-Jamshed, and unlike the multitasking abilities of the Grand Hyatt and Jimmy Boy, Godiwalla specializes in Parsi bhonu, especially the wedding spread. Every year, since she started with the family business in 1991, Godiwalla sells more than 1,500 set festive meals during New Year. For the 2007 event, she’s taking meal orders until today; Godiwalla does not deliver—she says it would be impossible—but sets up shop at the Albless Baug in South Mumbai’s Marine Lines for the day, from where pre-ordered meals may be picked up. “Parsi food has a certain sweetness to it. It’s the sort of food you can’t get anywhere else," says Godiwalla. So, while there may be no colour to throw about or crackers to fire, for a thoroughbred feast this Parsi New Year, score an invitation or grab a table at Jimmy’s.